Women, Our Parliament Still Needs YOU! So the 2017 General Election is over. There are 12 more women at Westminster making it a record 208 women MPs (32%). Some say we should be celebrating, but nearly 100 years after women gained the vote this is a SAD record. There are now 442 male MPs so men still outnumber women by more than 2:1 in the Commons and 3:1 in the Lords. On the government benches there are nearly four times more men than women. The corridors of power continue to look inaccessible and unrepresentative. Women are the majority in life but a minority at Westminster, if they are unable to participate fully in our political systems then many others must and do face insurmountable hurdles too. 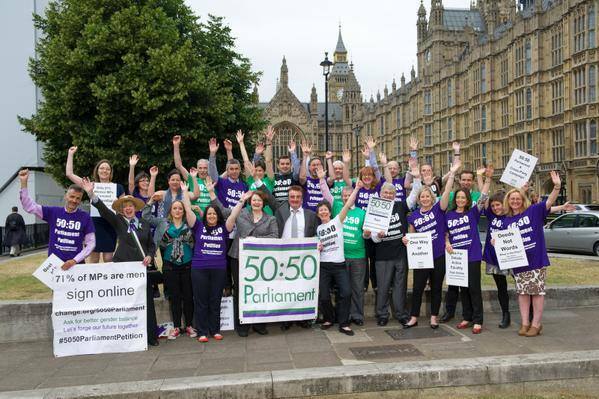 So join 50:50 Parliament in taking action and calling for a more inclusive, accessible, gender balanced Parliament; let’s build a better democracy together! 50:50 Parliament is a non-partisan campaign with a clear aspiration because “what gets measured gets managed”. 50:50 is making a difference, the number of women MPs has gone up from 23% when the campaign started in 2013 to 32% today, but this is not equality. 50:50 Parliament will not give up until our demands are met and we will continue to inspire, encourage and support political engagement. We believe that women should have an equal say in determining the future of our society and country and that Parliament would benefit from including the wealth of their experience. All the political parties agree a gender balanced, 50:50 Parliament would be better, but as the old suffragette saying goes we need “deeds not words!”. For equality we need 325 women MPs, sitting on the front and back benches and on both sides of the House, and 400 women peers. We are a long way off that. An extra 12 winning women might seem good, but it is not good enough. At this rate it will take another 10 elections to achieve gender parity, which is over 50 years and we cannot wait that long. For gender balance at Westminster we need 117 more women in the Commons and 200 more women in the Lords. From a population of 32 million women that should not be a big ask. In 1997, 60 more women MPs were elected. That’s more like it! 60 extra women would be true progress. So, the fight for equality is still on. If you agree that we need a more inclusive and gender balanced Parliament then say so and sign change.org/5050Parliament. 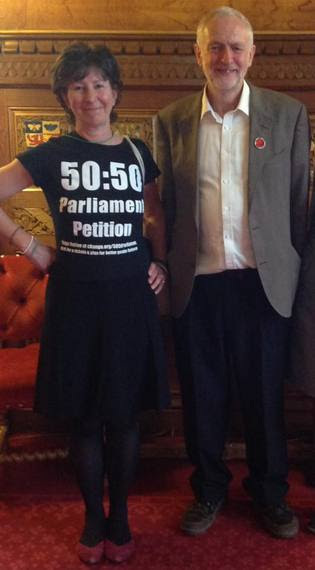 And if you know a woman who would make a great MP ask her to stand, 50:50 Parliament are here to support her. Jeremy Corbyn supports 50:50 Parliament and in this election the largest increase in women MPs came from Labour, with 18 more Labour women taking their places on the opposition benches. Women now account for 119 (45%) of Labour MPs. This goes a long way to meeting Jeremy Corbyn’s target of having 50% of Labour MPs being women by 2020. There are now 12 SNP and 4 Liberal Democrat women in the Commons. The record on the government benches is not so great. For the Conservatives, the number of women is down by 3. The 67 Tory women are outnumbered 4:1 by the 250 male MPs in their party. The DUP have one woman amongst their 10 MPs. There are many solutions to this historic problem, see them all outlined in the 50:50 Parliament submission to the Women and Equalities Select Committee. 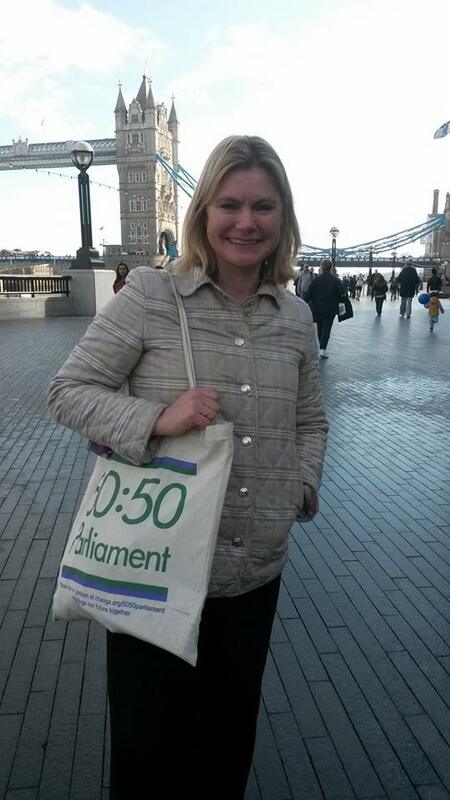 They include better recruitment and support of women in politics, which is why 50:50 Parliament launched the “Ask Her To Stand” campaign in December 2016, with great cross-party support from both Justine Greening MP (then Minister for Women and Equalities) and Jess Phillips MP, as well as many other Parliamentarians showing unity over this democratic aspiration. Maria Miller MP (then Chair of the Women and Equalities Select Committee) applauded “the work of 50:50 Parliament and the Ask Her to Stand campaign” when speaking in the chamber of the House of Commons. But if gender equality is a human right as specified in the UN Declaration of 1948 then perhaps the time has come for legislation. In December 2016 The Women and Equalities Select Committee recommended that at least 45% of candidates, in all the political parties, should be women. They even quoted 50:50’s submission in reference to this serious “democratic deficit”. This was the election where the youth were mobilised. It is clear that there is a yearning for change and a more modern style of government. Gender equality is part of that. This is a principle which should transcend politics. Men and women should not be competing for power but sharing it; running the country and determining our future together, in equal numbers. So if you know a woman who would make a good MP ask her to stand, our country still needs them. It should not be difficult to find 117 more women from a population 32 million – 50:50 Parliament is here to help. See our #AskHerToStand page on www.5050Parliament.co.uk and continue to put pressure on those in power by signing and sharing the 50:50 Parliament Petition at change.org/5050Parliament. Everyone unite in this, join 50:50 Parliament, let’s build a better democracy together!